across the entrance to which a bar exists, which cannot be passed by any vessel drawing more than eleven feet; the mud and shells, however, which choak [sic] up the channel could be very easily cleared away; the mud, in fact, can be sounded to the depth of eighteen feet: if the channel were deepened for about a hundred yards, the largest class of merchantmen could enter the compact basin of Corio Bay, and anchor within a ship’s length of the Jetty at the township. The bay is nearly land-locked from the outer harbour, and is about 3 miles in diameter, the area of the anchorage (the depth varying from 3 to 6 fathoms) is about four square miles. At present, the largest of the Van Diemen’s Land traders can cross the bar, discharge their cargoes of timber at the township, and return with a cargo of fat wethers for the Launceston and Hobart Town markets. The rise and fall of the tide is less than in any other part of Port Phillip. Of course history shows us that for some decades the Geelong Town Council had the channel dredged however each episode took so long that by the time the dredging was “completed” the overseas ships had doubled or trebled in size and could not fit through the newly deepened channel! Back to the drawing board! It was 1893 before the Hopetoun Channel was completed and opened – more than 50 years after this article! More can be read about the history of Point Henry. … a truly wonderful group of descriptions of the harbours around Victoria. 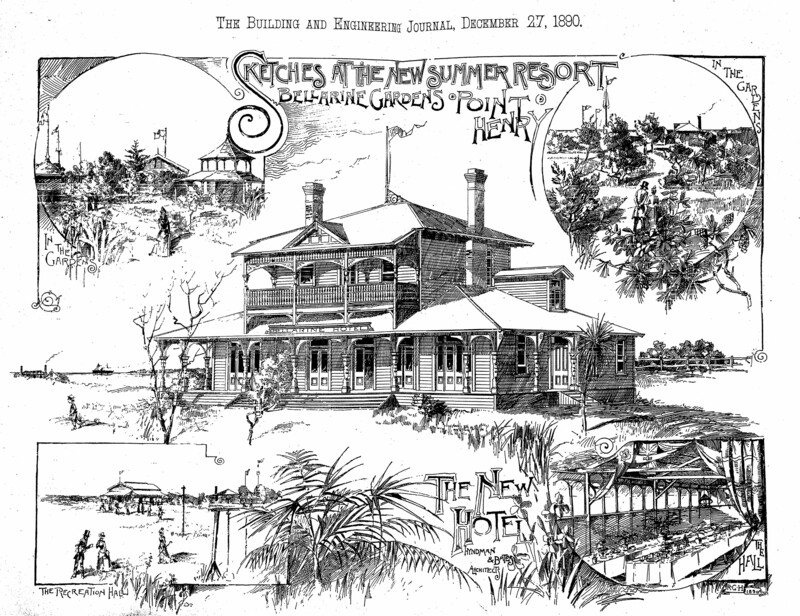 The sketch above is from The Building and Engineering Journal, December 27, 1890 and shows ‘Sketches at the new summer resort: Bellarine Gardens, Point Henry’. Another great article from 175 years ago.